“I am living the future that I dreamed about when I was a young boy, and for me it is just as bright and wonderful as I imagined it would be. Many of the paintings in this collection are my current graphic thoughts about tomorrow. One of the joys of being an artist is the freedom to create one’s own world, and through the use of brushes and paints, to explore that world and participate in adventures of the mind that the real world could not possibly provide. Like the real world, these excursions of the imagination are fraught with inaccuracies of perception-it is rare that one glimpses through the veil of time even a hint of tomorrow’s reality nor does it seem important to me, whether one’s perceptions are right or wrong-the pleasure is in making the predictions and doing the work. Today we live a world filled with awesome possibilities, both good and bad. The rush of technology is so rapid, to stay abreast of it has become more and more difficult. Our understanding of the physical universe continues to grow and astonish us with its marvelous complexity. The works of Robert McCall are a rich tapestry that encompasses more than just the history of space exploration and visions of the future. McCall is a talent whose depth and richness of spirit are translated into a special invitation. His work invites one to ride on a spectrum of color, brilliance, and imagination-to become part of the twisting kaleidoscope that is our ever-expanding knowledge of the universe. Robert McCall has done more than any other artist to enable Americans to visualize their nation’s presence in space. He has illustrated all of America ‘s finest moments, from the first manned space flight of Alan Shepard aboard Mercury 1 to Neil Armstrong’s first steps on the Moon; from the U.S.-Soviet joint Apollo-Soyuz mission to the most recent launches of the space shuttle. Ten million people a year admire his massive six-story-high mural in the National Air and Space Museum in Washington, D.C.; he has created stamps for the U.S. Postal Service that commemorate the space program. McCall has documented the NASA space program for more than thirty-five years. NASA’s provision of this ‘front row seat’ has allowed him to personally witness mankind’s progress and turn it into the magnificent renderings that link us together as residents of Planet Earth. In addition to being NASA’s visual historian, McCall has also sparked our collective imagination with regard to what may become our future history. Serving as conceptual artist for the entertainment industry, he worked on films such as Stanley Kubrick’s 2001: A Space Odyssey, the Star Trek movies and Disney’s The Black Hole. McCall is an optimist and dreamer, unrestrained by scale, unlimited by location, unconfined by the boundaries of what is known or what can be imagined. As one stands in awe of the visual poetry that is the art of Robert McCall it is apparent that this is a talent that competes with the scope of the subject itself. At first glance you might think he’s the local football coach: a burly, enthusiastic bear of a man who peppers his speech with “gee” and “golly” and exudes all the restless animated spirit of a grown Huck Finn. Yet if you watch him closely, if you study that expressive face, you see that there is a far look in his blue eyes, a gaze that sees into the future. At the easel, his expressiveness moves to the tips of his fingers. He falls silent. He stands before the easel or perches on a high stool for hours on end, as he paints. On the canvas a new glimpse of tomorrow begins to take shape. All the enthusiasm and knowledge pent up in him takes the form of a picture of futuristic beauty where human beings are building a good new world for themselves. If you are one of the he tens of millions who have visited the National Air and Space Museum in Washington , D.C. , you have seen the work of Robert T. McCall. His vast mural depicting man’s conquest of the Moon covers an entire wall on the Museum’s main floor, not far from the main entrance, where the Wright Brothers’ original flying machine is displayed alongside Lindbergh’s Spirit of St. Louis, the Apollo 11 command module and a sliver of rock from the Moon. If you saw the now-classic motion picture 2001: A Space Odyssey, chances are you were attracted to it by posters featuring the paintings of Robert T. McCall. His vision of the wheel-shaped space station and of space-suited astronauts on the Moon have adorned movie theaters and art museums around the world. If you have ever bought U.S. postage stamps that feature a scene from the American space program, you have probably licked the back of a Robert T. McCall picture. 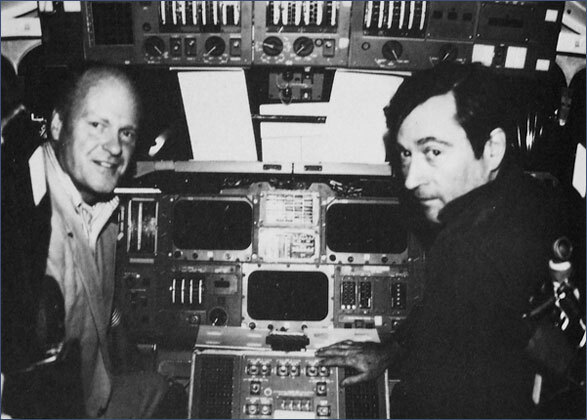 He has chronicled the history of Apollo, the Apollo-Soyuz joint US-USSR mission of 1975, and the more recent Space Shuttle missions for the Postal Service. Some of his stamps have been to the Moon and back. Like so many other men and women who find themselves not only fascinated by space exploration, but actively devoting their careers to it, Robert McCall first became interested in space flight and astronautics through reading science fiction. He was born in Columbus , Ohio , in 1919, a Middle American from the heart of the nation. He graduated from high school and won a scholarship to the Columbus Fine Art School. Like many an American, he started working even before his schooling was finished. At the age of seventeen he took a job with a local sign shop, which made posters for streetcars and outdoor advertising billboards. And he read science fiction magazines: Astounding Stories of Super Science, Amazing Stories, Startling, and Thrilling Wonder. The masthead Amazing proclaimed that the tales printed on its pulp pages were “Extravagant fiction today; cold fact tomorrow.” As true a prophecy as was ever made. The young Bob McCall also read Popular Science and National Geographic and other magazines about technology and exploration. Some magazines were bought at secondhand shops; others came from his grandfather’s collection. McCall’s father was a schoolteacher for most of his life “We grew up in very modest circumstances,” McCall says. There were no astronauts when Bob McCall was a teenager, only tales of space adventures in, pulp magazines. But he remembers the first flying machines he ever saw, a group of biplanes that roared low over Columbus when he was about seven years old. He got his chance to hear the driving, powerful roar of aircraft engines over and over again when he joined the Army Air Corps during World War II. McCall was sent to Kirtland Field, just outside Albuquerque , New Mexico . The war ended before he could be sent overseas. But while in Albuquerque he met Louise Harrup, who was studying fine art at the University of New Mexico . They were married within a year, a marriage that has produced two daughters — Linda and Catherine — four grandchildren, and a beautiful house in Paradise Valley , Arizona , that is filled with paintings — both Bob’s and Louise’s. Her work has been displayed in collections throughout the country, and she has had a number of solo shows. Within three years McCall was ready for New York , and in 1949 he and Louise arrived there. Instead of concentrating on advertising art, however, Bob began painting magazine illustrations. He worked for Life, The Saturday Evening Post, and even his childhood favorite, Popular Science. Much of his work dealt with aviation. 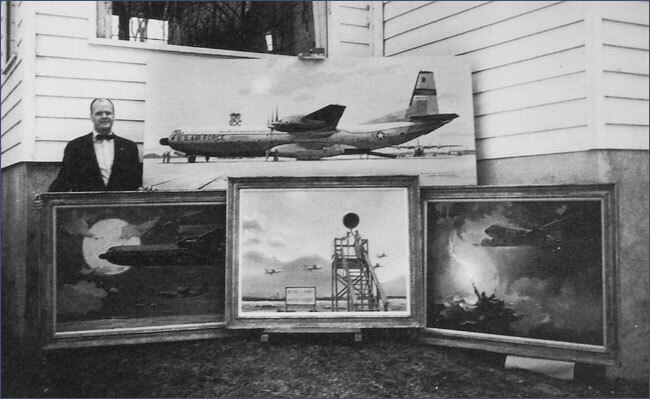 In time, McCall donated some 45 paintings to the Air Force. They hang in the Pentagon, the Air Force Academy, and in air bases around the world. Others are part of a traveling exhibition, open to the public. When the National Aeronautics and Space Administration (NASA) was formed, its administrators decided to initiate a similar art program. McCall was among the first to be invited to participate, along with some of the most well-known painters in the United States , such as Jamie Wyeth, Peter Hurd, Robert Rauschenberg, and Norman Rockwell. 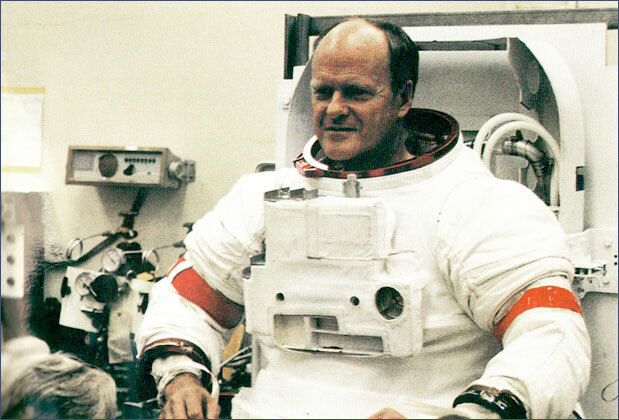 For Bob McCall, NASA’s rockets and astronauts were love objects at first sight. He became an eyewitness to the space program, covering every major launch, frequently at his own expense because NASA could not extend an official invitation to the same painter every time. But Bob McCall was there, every time. He was with the astronauts when they laboriously wormed into their cumbersome space suits. He even tried the task himself, to see what it was like from the inside. He went up the gantry elevator with them and watched them clamber into their spacecraft. He stood in the control center during the countdown and sketched the final tense moments before launch. He even went out on an aircraft carrier to witness the recovery of astronauts from an ocean landing. 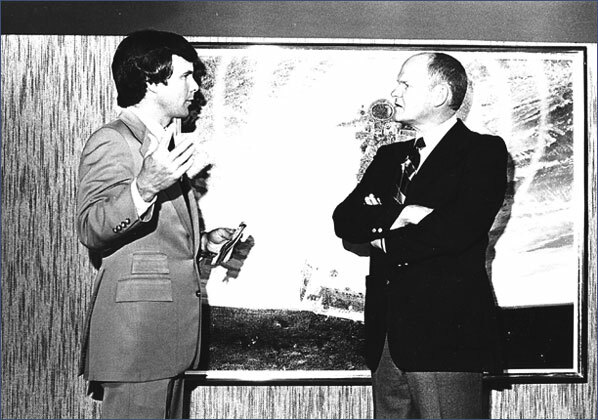 McCall began to paint the future. It started with paintings he did for Life magazine in the early 1960s, depicting future spacecraft. 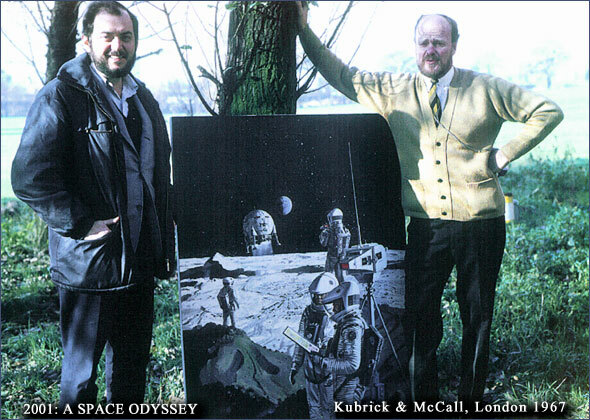 It accelerated when Stanley Kubrick invited him to England to paint advertising posters for the film 2001: A Space Odyssey. There he met not only Kubrick, but Arthur C. Clarke, the writer whose work in science fiction and engineering technology had helped to create the space program and the first communications satellites. 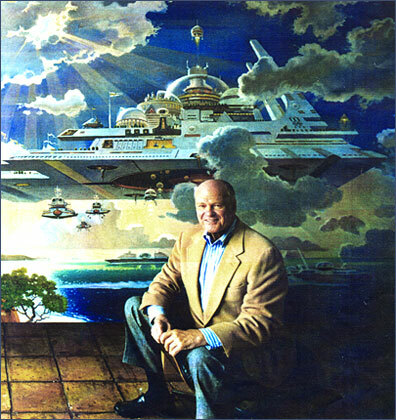 McCall began to paint the future. Not merely the spacecraft of tomorrow, but the entire range of human experience in a future where we use our technology to build a life of abundance and adventure. Reminded that most futurists and professional prognosticators forecast a good deal of gloom for the immediate future, McCall smiles and replies, “I think when we finally are living in space, as people will be doing soon, we’ll recognize a whole new freedom and ease of life. These space habitats will be more beautiful because we will plan and condition that beauty to suit our needs. I see a future that is very bright. 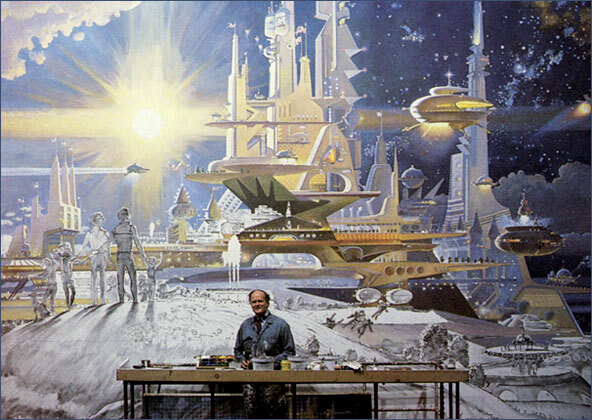 The uniqueness of Robert T. McCall’s vision of tomorrow is that what he sees with his inner eye he puts onto canvas in paintings that have all the sweep and power of a bold imagination, yet the detail and discipline to convince us that these futuristic scenes can be built by mortal hands. Because of his talent we can see this future too: inspect it, enjoy it, and I resolve to help build it. 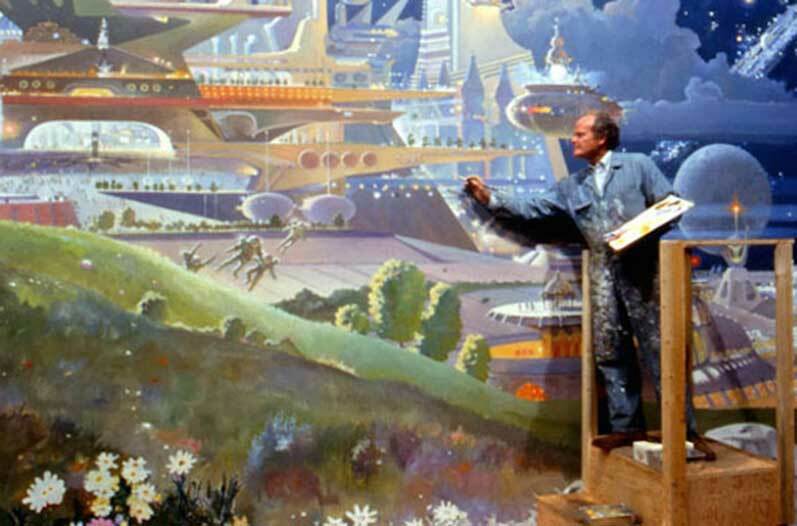 Robert McCall lives in two worlds. The first – the one that brought him fame as an artist -is the rich, fertile world of his imagination. It’s inhabited by countless images painted on a lifetime’s worth of stretched canvases: interplanetary spacecraft hovering over distant, heavenly bodies; space-suited astronauts exploring new frontiers; sleek airships rocketing through untold galaxies; and military men and women poised in postures of heroic service. McCall’s parallel world is the one that he inhabits as a husband, father, neighbor, and friend. From the sanctuary of a sunny hillside home in Paradise Valley, it’s the world that he and his wife Louise have lived in for the past 34 years-one in which they have served as generous volunteers and community patrons, where they dine in local restaurants, shop in nearby stores, entertain friends and relax on their patio, savoring the view. In short, it’s a world much like anyone else’s. In the comfort of the spacious, light-drenched studio that adjoins his home, Robert McCall appears trim, tan and relaxed. From his robust appearance, it’s difficult to believe that this internationally renowned artist will celebrate his 85th birthday in December. As if to emphasize the fact, he casually swings his right leg over the armrest of an office chair and sits in that manner throughout a lengthy interview. It wasn’t long before McCall began sketching from aspects of his own life. Drawing on his experience skating on ice covered ponds around the Columbus area, he began sketching ice skates. “I drew the blades and lacings of speed skates, figure skates-anything I could think of,” he says. Other inspiration came from the artists working in the books and magazines that he regularly absorbed. One in particular, N.C. Wyeth, was considered to be the premier illustrator of his day “He was a giant; the passion and drama that he developed in his work were just remarkable,” McCall says. From there, McCall began a life-long fascination with painting armor-clad and uniformed knights and other heroic figures. “I drew their likenesses from the books of fairy tales that we had,” he remembers. Then, on a family trip when he was a teenager, McCall visited the 1933 World’s Fair in Chicago. “I was blown away and just inspired by what I saw there, and the science that was galloping at that time,” he says. He later attended art school on a scholarship in that same city. From Chicago, McCall migrated to New York City where most of the magazines he was interested in doing work for-life, Popular Science, The Saturday Evening Post and Colliers-were published. Through the years, they became frequent vehicles for his increasingly sophisticated work. 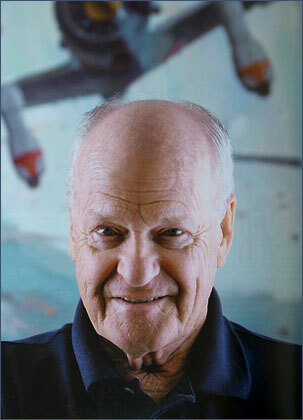 “One of the first jobs I got for Life was doing a series of illustrations of the events at Pearl Harbor. It was a real challenge and a fabulous opportunity” he says. Out of this early experience, McCall says he found his true niche in painting imaginative, futuristic, technological subjects. “It really began with drawing ‘The Automobile of Tomorrow’ for Popular Science” he notes. “This became a very popular feature in the magazine. 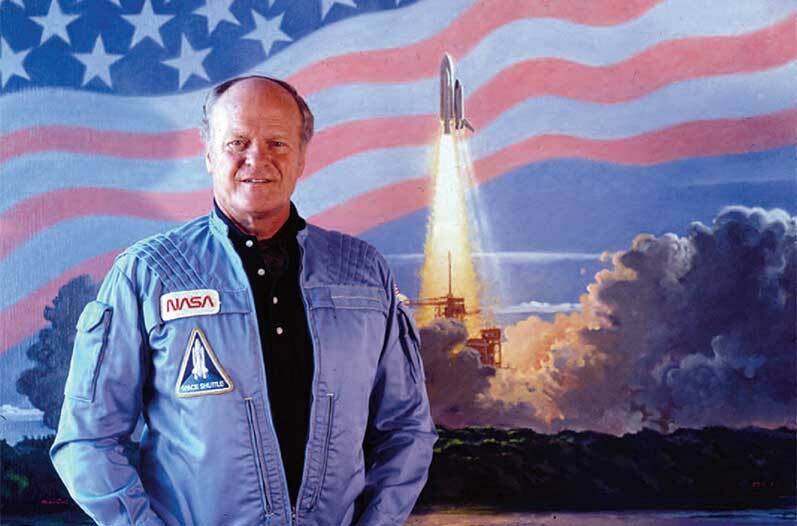 If there was a defining moment in McCall’s experiences that he says absolutely shaped his artistic vision, it was when he began his association with the National Aeronautics and Space Administration. “I became directly involved with NASA in 1956, when I met astronauts and visited actual launch sites” he says. As a member of the Society of Illustrators, McCall was given wide access to NASA, its plans and projects. The experience provided him with background for some of the illustration work he was doing for the U.S. Air Force, as a civilian. “They were delighted to have members of the Society down at Cape Canaveral,” he says. 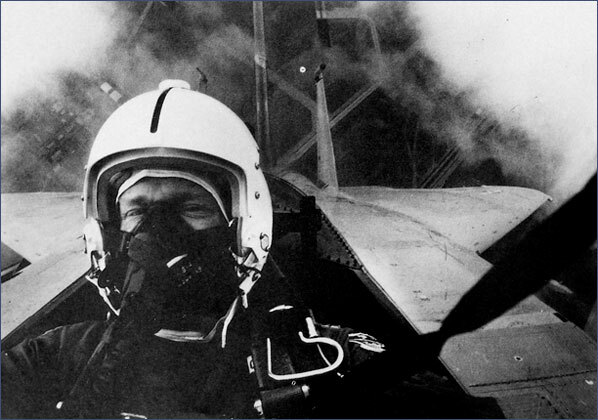 “I did a lot of flying in the back seat of fighter aircraft. I just loved it.” With his increasingly impressive resume’, McCall ended up doing illustration work for big aerospace manufacturers, such as McDonnell-Douglas and Sperry. 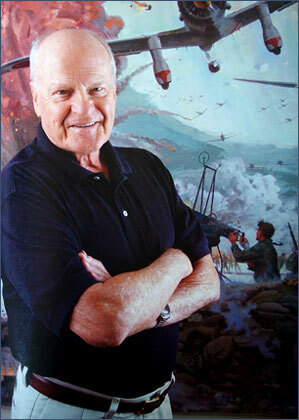 “For a time, because I was doing so much of it, I was considered to be one of the preeminent aviation artists,” he says. With much of his work in New York, McCall and his wife eventually settled in the upstate town of Chappaqua; but, after 15 years, they were ready for a move. In 1970, they visited Paradise Valley at the invitation of some New York friends who had relocated here. “Within three or four days, we saw the house we live in today and bought it on impulse. We’ve never regretted it,” he says. Over the past few decades, McCall’s artistic output has been prolific. With permanent installations in many of the country’s best-known museums and science institutes, he has become one of the United States’ most recognized visual chroniclers of space-focused technology and its impact on our culture. A praiseworthy and prolific artist in her own right, Louise McCall works in a decidedly different niche than her husband. Her impressionistic portraits and paintings of flowers in vases brighten the spacious rooms in the McCalls’ lovely home. And, like her husband’s, Louise McCall’s work has become highly public. Several years ago the McCalls collaborated on a breath-taking stained glass project at their church, Valley Presbyterian in Scottsdale. The Reverend Dr. Larry Eaken, thc church’s associate pastor, says that their contribution has been inspirational for his congregation. “Bob and Louise’s work in our chapel has certainly provided a spiritually uplifting and joyous atmosphere for any of the numerous events held here,” he comments, adding, “Regardless of anyone’s religious persuasion, this is beautiful work that anyone can appreciate.” More recently, Louise completed a major installation for the new Virginia G. Piper Cancer Center at Scottsdale Healthcare. These days, the McCalls are busy with plans for a new Phoenix-area museum that will showcase a large portion of McCall’s space-based art collection. The Robert McCall Museum is being planned as an 80.000 square-foot facility dedicated to space, space artistry and contemporary art, with more than 350 pieces documenting the history of space flight. “It’s one of our biggest endeavors-a place of inspiration for young people,” McCall says. The museum, which has a projected opening date of 2005, is tentatively planned to be located adjacent to the Challenger Space Science Center, in Peoria. There are also plans for it to contain a separate Smithsonian gallery showcase art treasures from America’s national museum. There’s little time for the McCalls to slow down, it seems. They just returned from a trip to Ireland and London with their two daughters and one of their grandsons in tow. From all indications, it appears that life – whether it’s in Paradise Valley or a galaxy far, far away – is very good. Paradise Valley, Arizona (CNN) — Even if you haven’t heard of Robert McCall, you are still probably familiar with his work. You will find his wide-eyed (and just plain wide) views of space — past, present and future — spanning the entry hall of the Smithsonian’s Air and Space Museum; at the Horizons pavilion at Disney’s EPCOT center; in old movie posters for “2001: A Space Odyssey,” or in a two-decade-long series of postage stamps depicting space themes (talk about pushing the envelope …). 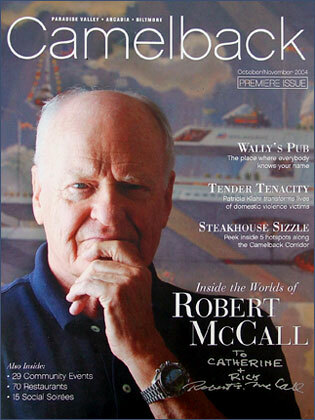 No, Robert McCall may not be a household name, but his work has household familiarity. An art school graduate from Columbus, Ohio, with a lifelong fascination with things that fly, McCall has illustrated the reality and the dreams the space age since it all began more than 40 years ago. I got the idea for doing a story on McCall during a visit to NASA Administrator Dan Goldin’s office. I was thinking of ways of telling the Apollo 11 anniversary story when I stumbled onto my inspiration. Prominently displayed just outside Goldin’s door is a McCall “Mars-scape” depicting astronauts at work on the red planet. It is vintage McCall. The machinery is intriguing and detailed, the spacefarers seem as if they are part of a heraldic pageant (as a boy, he had a fascination with drawing knights in shining armor) and the terrain is rugged and sweeping. Actually, those mountains are reminiscent of the range that lies outside McCall’s picture window (naturally) in his roomy studio at his home here. He says he moved to Arizona (from New York) in 1970 after a visit left him artistically inspired and personally enamored with the lifestyle. Pass through the antique Mexican doors into the courtyard of McCall’s home, and you will be greeted by the other artist in this residence: Bob’s wife of more than 50 years, Louise. While Bob’s head was up in the clouds (literally and figuratively) for most of his artistic career, Louise has remained well grounded (literally and figuratively). She is a painter of flowers — and a fine and prolific one at that. For years her career was overshadowed by Bob’s success and sidetracked by the demands of raising two daughters. She served as an adviser and assistant to Bob as his career took flight. But it’s obvious what collaboration they are most proud of. We followed them down the road a few miles to see it — at their church (Valley Presbyterian). When the congregation decided to add a small, chapel-in-the-round for smaller ceremonies a few years ago, they called upon this artistic pair in their midst to design the stained-glass windows. Standing in the middle of the chapel, the pair guided me through the work. Not long after it was finished, and not long after the Challenger disaster, the widow of the commander of the doomed flight, June Scobee visited here. After gazing into the glass and reflecting, she told the McCall’s she knew where her husband was. The McCalls’ eyes glisten as they recount the story. We spent two marvelous days with the McCalls — seeing them at work — talking with them about life in general. They seemed like a young couple. It is hard to believe they are well into their 70s. That’s what happens when you have — and share — a passion. You never really grow old. 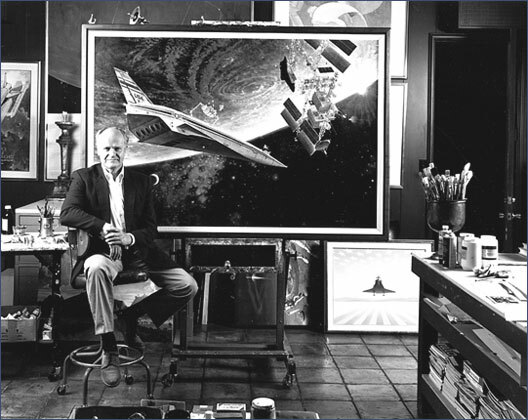 The world of internationally renowned space artist Robert McCall knows no boundaries. Spanning the universe, both in time and distance, his artwork has chronicled the U.S. space program since inception and provided aerospace devotees an educated guess of what interplanetary space travel could look like in the future. 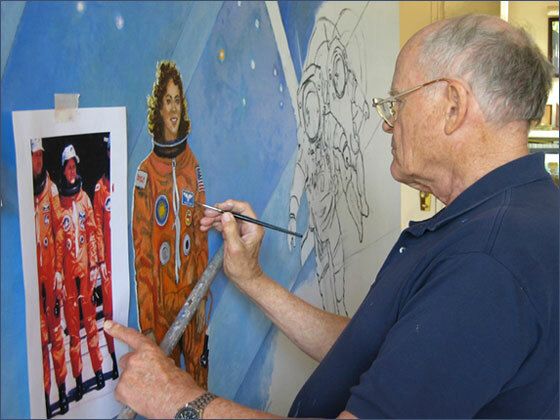 At 86, although he looks much younger, McCall is still driven by the same enthusiasm and vision that launched him into a lifelong career as a space artist, back in 1956, when he made the NASA connection. He continues to be optimistic about technology and the future, spreading a positive outlook that has never wavered, even in the wake of the Challenger disaster. An Arizonan for the past 36 years, McCall’s canvases and illustrations, the trophies of a prolific life long career, adorn the walls of his studio and spacious home, built on a picturesque hillside in the upscale community of Paradise Valley. It’s in this sanctuary, which McCall shares with the other artist in the house, his wife Louise, that he does most of his painting. The couple met when she was a 19-year-old art student. They have been partners in art and happily married for 61 years. An accomplished artist, her impressionistic portraits and paintings of flowers brighten up many of the rooms in the McCall home. Being an Arizona resident, it’s only fitting that McCall have a major work of art on local display. In downtown Phoenix, at the Industrial Commission Building, is McCall’s multi-story mural entitled “The Spirit of Arizona.” The panorama depicts the history of the state, past, present and future. 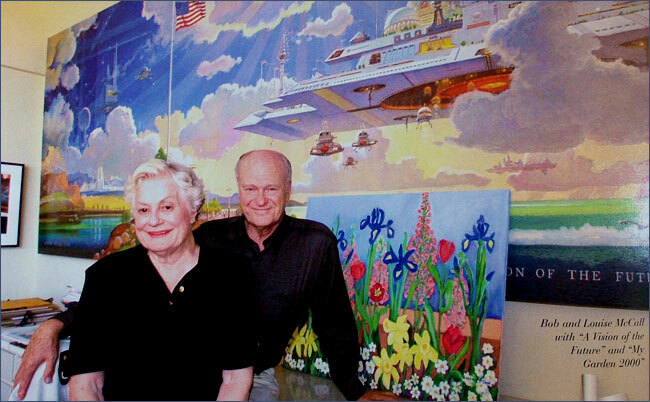 McCall collaborated with his wife, who painted the beautiful wildflowers displayed in the foreground of the mural. This was McCall’s longest project; it took one and a half years to complete. In 2003, the nation celebrated the 100th anniversary of man’s first powered flight, made by the Wright brothers. 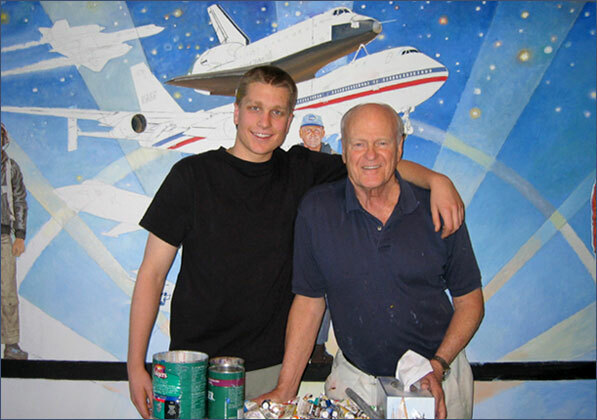 When NASA commissioned McCall to paint the “Centennial of Flight” mural, he was ecstatic. “When I received the commission, I thought, ‘This is just what I would love to do, more than anything. I want to make a painting that brings together all of my great passions as an artist and paint the subjects that have driven me intellectually and professionally for a lifetime,'” he recalled. McCall immediately went to work gathering the requisite information, organizing it so that it would tell a logical story on a timeline that reads from left to right and chronicles the evolution of powered flight. In the center of the painting is the rising sun, with the Wright brothers’ first flight silhouetted against it. 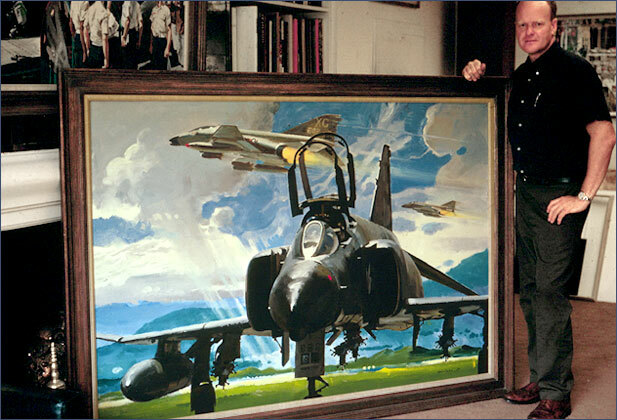 Hearing McCall’s description of the mural, in his own words, provides a philosophical insight into the creative mind of a master painter and enhances one’s understanding and appreciation of a truly profound work of aviation art. McCall is a visionary whose prodigious imagination has been effectively captured in oils, acrylics and watercolors for more than half a century. The majority of his work is optimistic, celebrating the joy of living, man’s technological progress and the many wonders in nature. McCall was born in Columbus, Ohio, in 1919. His first painting, at age 15, for which he received compensation, was of an Irish setter he painted for his dentist. McCall did his first serious commercial work at age 16; he was paid $25 for the drawing of a water purification plant he did for an engineering firm.McCall also found he had an interest in science. In 1933, he attended the Chicago World’s Fair. 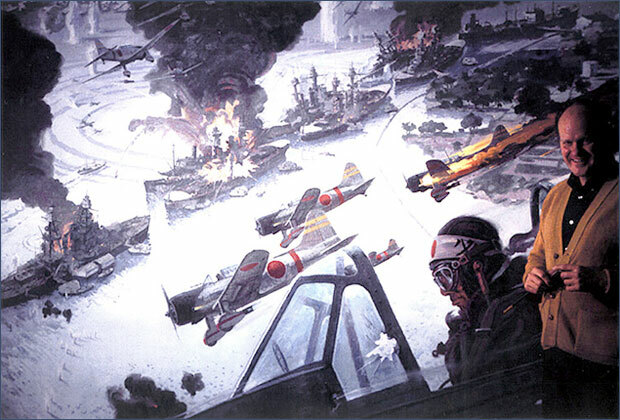 He was inspired by what he saw there, which included aircraft displays. Growing up in Columbus, Ohio, put him close to the city of Dayton. McCall remembers seeing lots of action in the sky, including airplanes being flown in mock combat demonstrations. He now had a passion for flight. So much so, he later enlisted in the Army Air Corps, where he became a bombardier on a B-29. He attended the Columbus College of Art and Design on a scholarship and became a professional illustrator. “I did anything that came my way,” he said. He worked for Ziff Davis publishing and had Ford Motor Company for a client; his automotive art was used in magazine ads. He had many spreads in Newsweek and Time magazine and his illustrations could be found in Colliers, Popular Science and Field and Stream. He even did romantic illustrations for the Saturday Evening Post. In those days, McCall’s artwork seemed to be everywhere. Then, in 1956, he went to work for Life magazine. This proved to be a defining event that would profoundly shape McCall’s future career as an artist. Life sent him to Washington D.C. and Cape Canaveral to cover the nation’s fledgling space program. “My outstanding work was for Life magazine,” he said. His entrée into NASA signaled the beginning of a lifelong career, documenting the space program using brushes and paints. NASA provided McCall with a front-row seat during all of the space launches, and McCall provided NASA with vivid renderings that captured the drama, action and brute force of its soaring rockets. His illustrations and paintings recorded it all, from Mercury to Gemini, to Apollo, to the space shuttle and the stars beyond. When speaking of his art, McCall says, “My work is a vision of the future that I endeavor to graphically portray.” Isaac Asimov once described him as “the nearest thing to an artist in residence from outer space.” His images are said to celebrate the human spirit and man’s quest to explore and comprehend the vast universe in which he finds himself. McCall’s “Opening the Space Frontier-The Next Giant Step,” is a sizeable 16-foot by 72-foot mural displayed at the Johnson Space Center. This 1979 painting depicts the first two decades of American space exploration, starting with Mercury and the first manned space flight of astronaut Alan Shepard on May 5, 1961, to the Gemini, Apollo and space shuttle programs that followed in the 1970s and 1980s. The mural includes a look into the future when permanently manned space stations will routinely orbit the earth. McCall’s painting, “First Men on the Moon,” done in 1971, captures the moment on July 20, 1969, when Neil Armstrong and Edwin “Buzz” Aldrin became the first humans to walk on the moon. In another mural, “Stairway of Humanity,” McCall collaborated with Andrei Sokolov, one of the Soviet Union’s most renowned space artists, to produce a 6′ x 9′ painting that recognizes the accomplishments of the first three decades of U.S./Soviet efforts in space. There were both ups and downs in the space program. In 1981, McCall did an oil painting depicting the first successful launch of the Space Shuttle Columbia from the Kennedy Space Center, capturing all the fire and brimstone that such a launch entails. Then in 1987, he painted a commemorative piece on the last flight of Challenger, on Jan. 28, 1986. Flight research has been a big part of NASA’s activities. 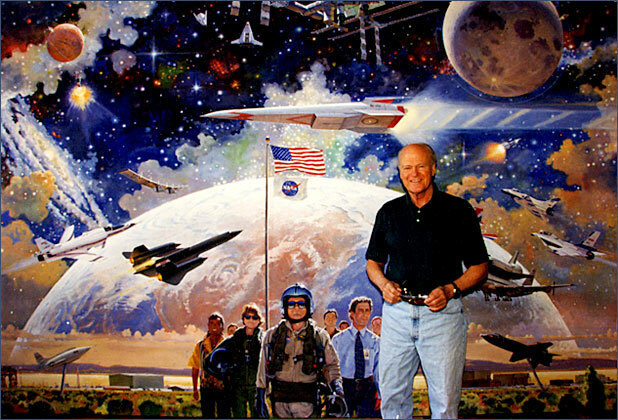 In 1977, McCall painted his 10′ x 20′ mural, “The Spirit of Flight Research.” It was a graphic portrayal of experimental NASA aircraft, the space shuttle and its B-747 carrier, Chuck Yeager’s X-1, Glamorous Glennis, and the rocket-powered X-15, which advanced the speed record from Mach 3 to Mach 6. 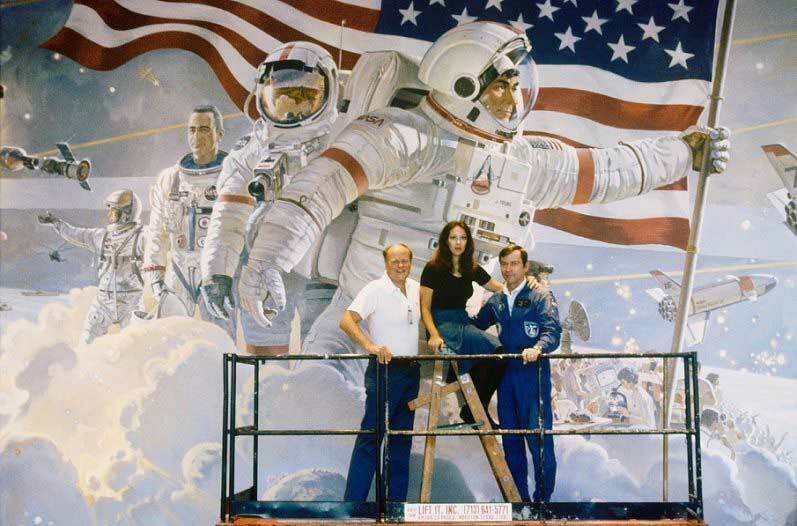 In 1982, McCall put brush to canvas to create “The Spirit of NASA” for the Disney Corporation. On display at Epcot Center in Florida, it profiles the hundreds of support personnel, scientists and technicians and support aircraft that are essential to the success of every mission. It shows John Young and Robert Crippen preparing for the maiden flight of Columbia. McCall’s canvases have captured the moment in every major space event, and his infinite vision and soaring imagination have provided us all with insightful views of man’s possible future in space. This seemingly endless stream of art has depicted everything from tomorrow’s weapons, such as a nuclear-powered beam weapon, striking targets from its orbital track high above the earth, to establishing an outpost on Mars. Other subjects include looking for primitive life forms in space; exploring the asteroid belt between Jupiter and Mars; and floating cities, where, by transcending gravity, we’ll be able to move the structure in which we live and work to any place desired. McCall designed 24 space-themed postage stamps for the U.S. Postal Service, two of which were cancelled on the moon. He also designed the mission emblem for the first space shuttle flight, STS-1. Today, McCall remains very active; although admittedly slowed down a little, he continues to paint. His pet project is overseeing the construction of the Robert McCall Museum of Art, which will provide a showcase for his unique and very special space-oriented art collection. It’s very unusual for one artist to own and possess such a large number of his original paintings. The collection consists of nearly 500 pieces, one-third of which are framed. Additionally, there are numerous sketchbooks and drawings. McCall is currently considering several possible sites in Phoenix and Tucson to build the museum. This world- class art collection will be a valuable educational and cultural addition to any community fortunate enough to receive it. Robert McCall is undoubtedly the premier space artist of our time, and in many circles, already regarded as the “Father of Space Art.” For a man who has dedicated his career to documenting NASA and the nation’s space program, the museum will be a perfect legacy. Robert T. McCall, an artist whose fervor for space exploration found expression in his six-story-tall mural at the National Air and Space Museum and two postage stamps canceled on the Moon, died on Feb. 26 in Scottsdale, Ariz. He was 90. The cause was heart failure, his wife, Louise, said. Mr. McCall eagerly translated his youthful enthusiasm for drawing knights in shining armor on spirited steeds into paintings of intrepid astronauts in gleaming space vehicles, both real and imagined. When NASA in 1962 hit on the idea of enlisting artists to promote its mission, Mr. McCall was one of the first three chosen. He went on to create hundreds of vivid paintings, from representations of gleaming spaceships to futuristic dream cities where shopping centers float in space. His most famous image may be the gargantuan mural, showing events from the creation of the universe to men walking on the Moon, on the south lobby wall of the National Air and Space Museum on the National Mall in Washington. More than 10 million people a year pass it. Then there are the mission patches he made for astronauts, including one for the last men to walk on the Moon; the many paintings that hang in military buildings from the Pentagon to the Air Force Academy; and the enormous mural at the Johnson Space Center in Houston showing the progression of the American space program, from the first Mercury missions to the space shuttle. He also designed more than a dozen stamps for the United States Postal Service, and a set was ceremoniously canceled on the lunar surface by David Scott, commander of the Apollo 15 mission. 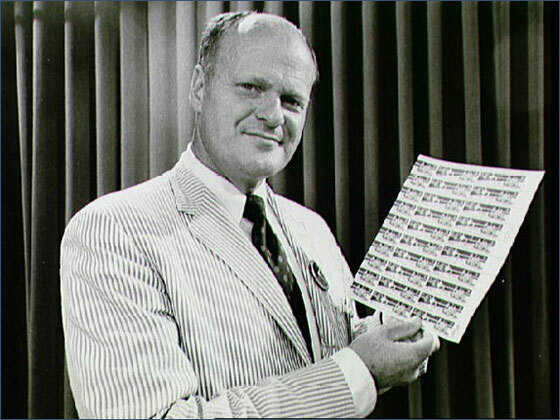 Robert Theodore McCall was born in Columbus, Ohio, on Dec. 23, 1919. He grew up fascinated with airplanes and looking at Moon craters through a telescope, but the first painting he sold was of a dentist’s dog. He was paid $10 for it. He studied at an art school in Columbus and served in the Army Air Forces during World War II as a bombardier instructor. He worked in Chicago and New York illustrating advertisements and magazine articles, including science fiction in pulp magazines. In 1957 he went to Cape Canaveral in Florida to paint at the request of the Air Force. His freelance work for Life magazine on the future of space exploration captivated NASA, which was starting to hire artists to add flair and emotional depth to portrayals of its work. 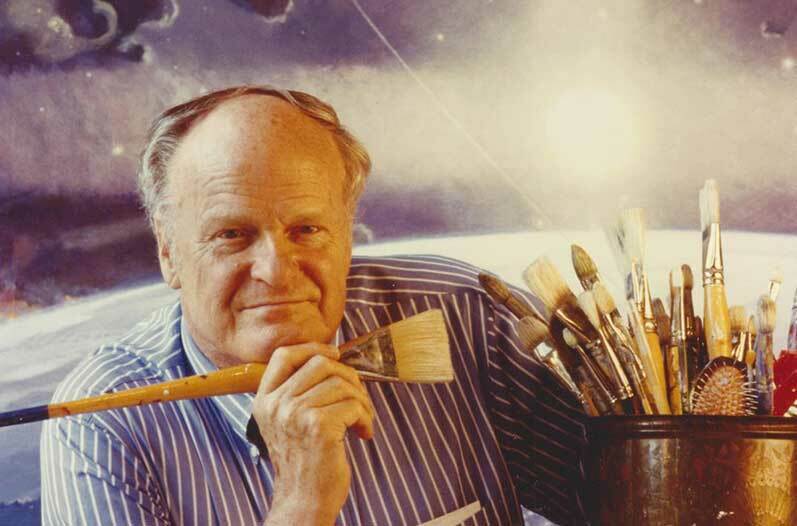 The other two artists NASA first approached were Mitchell Jamieson, a well-known illustrator who had worked with the Navy, and Andrew Wyeth, whom a poll had designated “America’s most popular painter.” Mr. Jamieson accepted, but Mr. Wyeth ultimately declined. As the program grew, more venturesome and abstract artists were added to the realists first commissioned, including Robert Rauschenberg. Other artists in the program included Andy Warhol, Norman Rockwell and the photographer Annie Leibovitz. Though his illustrations of manned space flight include Alan Shepard’s first Mercury mission, Mr. McCall did not attend a launch until Gordon Cooper blasted off in May 1963. In an interview with Smithsonian magazine in 1984, Mr. McCall described the exquisite tension of riding an open-cage elevator to the space capsule with Cooper. “You get in the habit of wanting these experiences,” he said, saying he imagined himself in Cooper’s shoes. Mr. McCall went on to witness more than 25 additional launches, including most trips to the Moon and most space shuttle missions. In addition to his wife of 64 years, the former Louise Harrap, Mr. McCall is survived by their daughters, Linda and Catherine McCall; five grandchildren; and six great-grandchildren. Mr. McCall’s great disappointment was that he never made it to space himself. When NASA began a program to take people from other professions on shuttle missions, he was on the list. But after Christa McAuliffe, a teacher, died when the space shuttle Challenger exploded on Jan. 28, 1986, that program was ended. Just inside the entrance to the National Air and Space Museum is a multi-story mural. 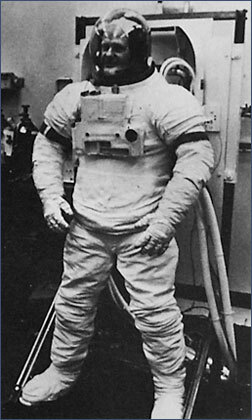 In its center, a fully suited Apollo astronaut gazes out at museum-goers, lunar dust suspended in the air around his boots. To the astronaut’s left, is the artist’s swirling depiction of the Big Bang Theory on the creation of the universe. And to his right, is a lunar rover and the Apollo lunar lander, its gold foil glimmering. The sprawling mural is a preview to what awaits. Peer around the corner and you’ll see an actual Apollo lunar module. Visit the Apollo to the Moon gallery and you’ll see the original space suits worn by Neil Armstrong and Buzz Aldrin on the Moon. “The Space Mural – A Cosmic View,” as the painting’s called, has become an important piece in the museum, and its maker Robert McCall, one of the world’s best space artists. But the sad news of McCall’s death is spreading throughout the air and space community. Last Friday, the 90-year-old artist suffered a fatal heart attack in Scottsdale, Arizona. 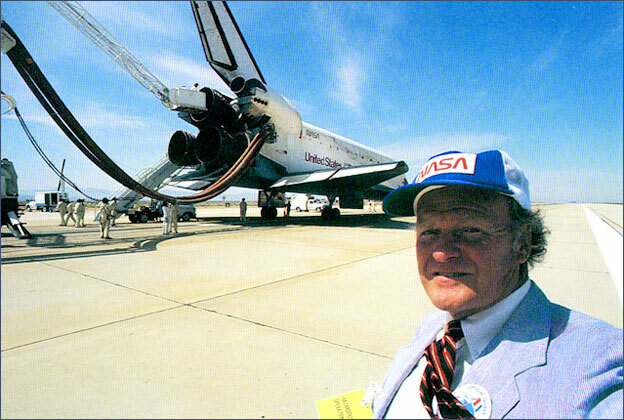 McCall attended every major shuttle space launch for decades and was praised for his futuristic views of space, and how they pushed space exploration forward. In his 60-year career, the prolific artist produced more than 400 paintings. He had such wide range as an artist—making everything from patches worn by astronauts and 21 space-related postage stamps, to the six-story mural at the Air and Space museum, which he painted over the course of eight months in 1976. “Artists throughout history have been called on to make visual records of great events, and yet very few have been eyewitnesses of the events they portrayed; no artists accompanied Columbus or Marco Polo, none were present at the Crucifixion. NASA’s space program has been an exception to this rule. Since the programmers could pinpoint to within a split second when a major event would take place, it was possible to give the artist a ringside seat on history in the making. The NASA space program also had the great good fortune to have precisely the right person available to make this unique documentation. 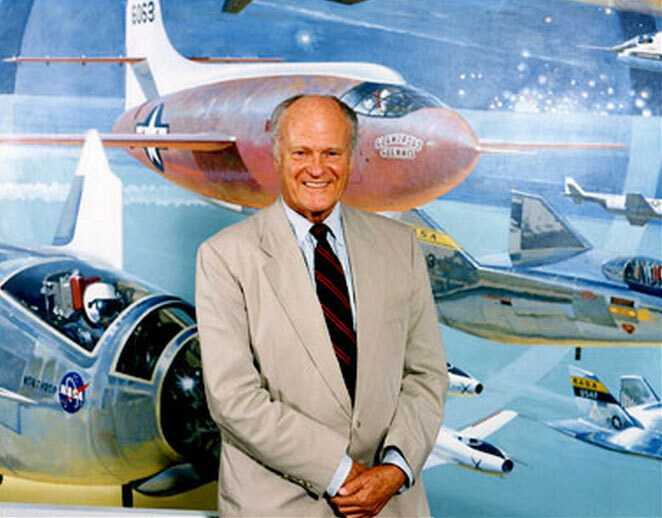 Robert McCall was a flyer with the Army Air Force in World War II, and in the years later had made a specialty of illustrating air-space themes. He was in charge of the Air Force’s Art program for a number of years, and his imagination and technically precise illustrations were known to millions through the pages of LIFE, TIME and scores of other illustrated periodicals. When officials at NASA decided in 1962 that only the artist could add a new dimension to our understanding of the epoch-making events of man’s first steps into the great beyond, Robert McCall was a logical choice to be one of the handful of original artists commissioned for this task. When the last Mercury one-man space craft was launched from Cape Kennedy in 1963, Robert McCall was up in the gantry making on-the-spot sketches of Gordon Cooper being bolted into his fragile nose cone. 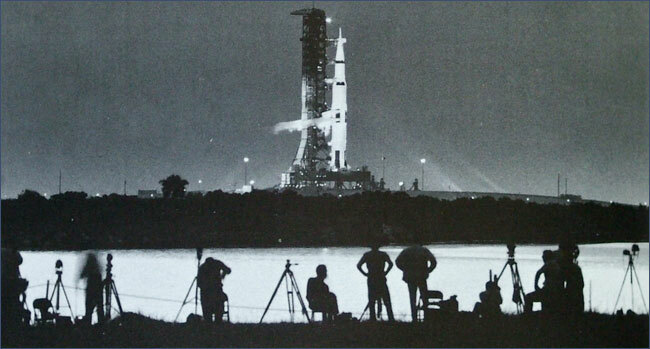 When the gantry was moved back from the rocket just prior to launching, McCall was still on top of the gantry – dashing off page after page of ink drawings. Today, these on-the-spot drawings form a priceless archive of one of the great moments in history. Again and again, McCall, often at his own expense and taking precious time from patrons clambering for his services, went to Cape Kennedy, or the aircraft carrier in the Pacific, or Mission Control in Houston, in order to cover at first hand every phase of the space program. –Hereward Lester Cooke, Jr. Ph.D.
My name is David Tress and as of this past weekend I am an alumni of the Columbus College of Art and Design. Robert McCall was our inspiring graduation speaker this weekend and I just wanted to thank him for coming to address the class. I would particularly like to mention that after the ceremony my father was a little choked up to tell me of his admiration of Mr. McCall over the years. My father who is now 59 said how since he was in Jr. High he had always been a huge fan of Mr. McCall’s work. He said that anytime he sees a science fiction illustration he always checks to see if it was by Mr. McCall, and that he has been his favorite artist. However, it wasn’t until this weekend that he found out that his favorite artist was an alumni of the very school that he had sent me to for the past four years. It’s somewhat of a rarity for my father to express much interest or emotion over much. Again, I would just like to thank Mr. McCall for his words to my class and more importantly, for being a lifelong inspiration for my father. In July of 2001 I had the pleasure of meeting and speaking with renowned space artist Robert T. McCall at the San Jose Tech Museum during the 2001: Destination Space Exhibit. This was exactly 33 years to the week after being visually stunned by viewing 2001: a space odyssey on an enormous curved Cinerama screen for the first of many times. Along with numerous set items from that film, including some of my original film posters, were over 70 paintings by McCall on display with brilliant colors, concepts and visions illustrating his unfettered sense of optimism and vast potential of the human spirit. Many authors have mentioned that McCall resembles a high school football coach, and for one who played six years in junior high and high school, that comment is certainly quite accurate. Behind that Midwestern exterior is a sincere and truly honest gentleman who has created the finest images, both fact-based and fictional, of the use of science and technology to benefit all humanity. The media is filled, however, with seemingly never-ending pointless stories of banal politicians, talentless actors, famous for one year pop stars, and other inconsequential societal sponges who contribute absolutely nothing positive to the world. Considering the amount of air time that these nominal individuals receive, one begins to sense that this type of news is what people actually clamor for in their daily lives. 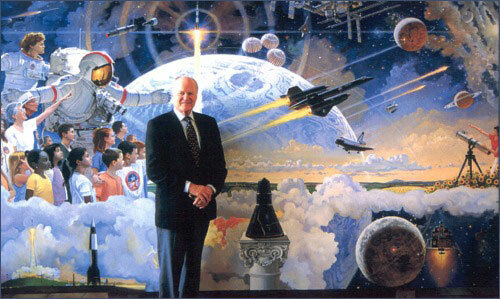 But Robert T. McCall is part of that special group of people who have literally reached for the stars. For those of us who just know better and have an appreciation of true artistry in all its mediums, we know in our own lives that these individuals – talented artists, designers, writers, filmmakers and many others have contributed much more to society and humanity than even we can imagine. Bob and Louise McCall with "A Vision of the Future", and "My Garden 2000"
McCall at Dryden in front of "The Spirit of Flight Research"
Bob with grandson, David, in front of "Celebrating 100 Years of Powered Flight"
McCall in the midst of painting "The Prologue and the Promise"
Bob stands next to his painting from the film "Tora, Tora, Tora"
McCall with astronaut John Young on the flight deck of the Space Shuttle simulator at the Johnson Space Center. 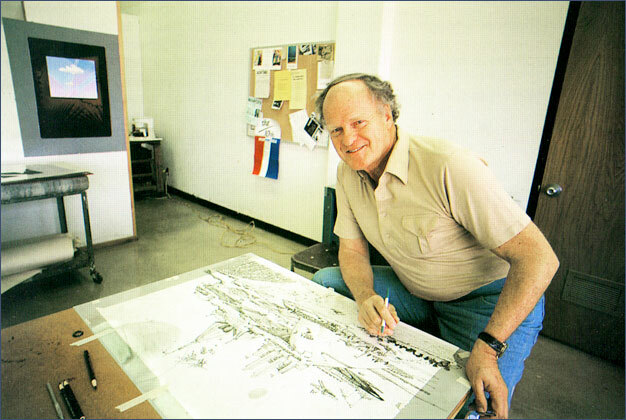 Bob in his studio in Paradise Valley, AZ, with the completed "Exploring the Space Frontier", 1988. 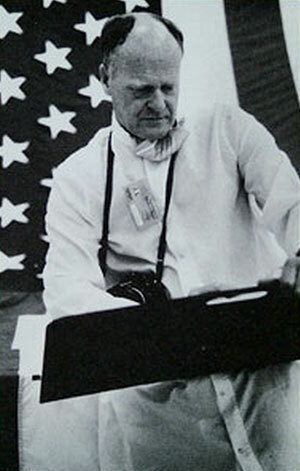 McCall sketching in the suit-up room on the day of the first flight of Columbia. 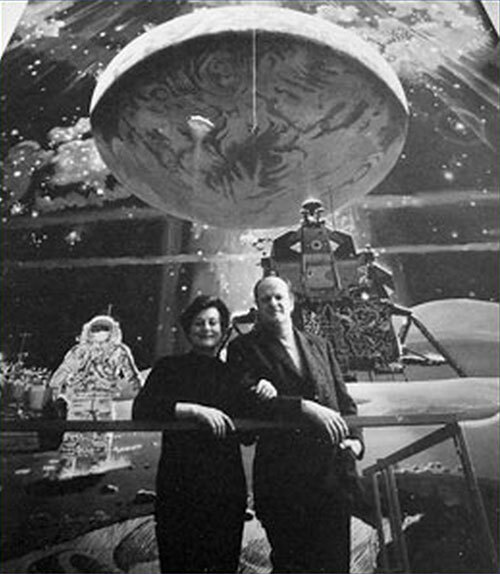 Bob and Louise McCall in front of The Space Mural. McCall flying in an F-15. The runway in the picture is the one from which the plane has just taken off.